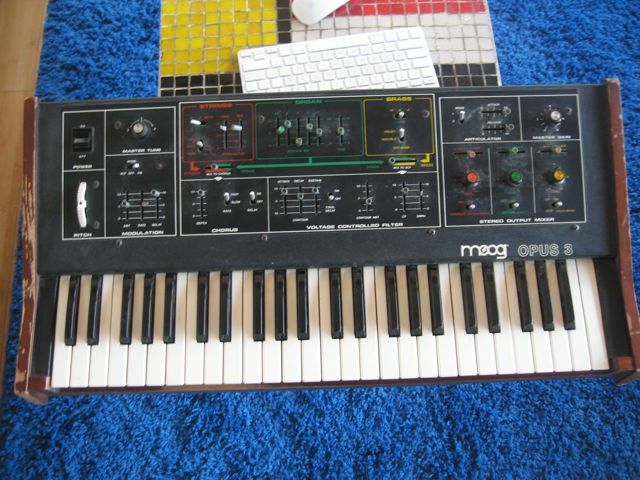 There is an era of Moog -basically the Rogue, the MG-1 and the Opus 3- where they decided to protect the sliders and toggles by placing a foam sheet over them. Turns out this was a petroleum based foam sheet that 30 years on has turned to tar. Removal of this tar is mans work and no fun, but doable. I just takes patience. 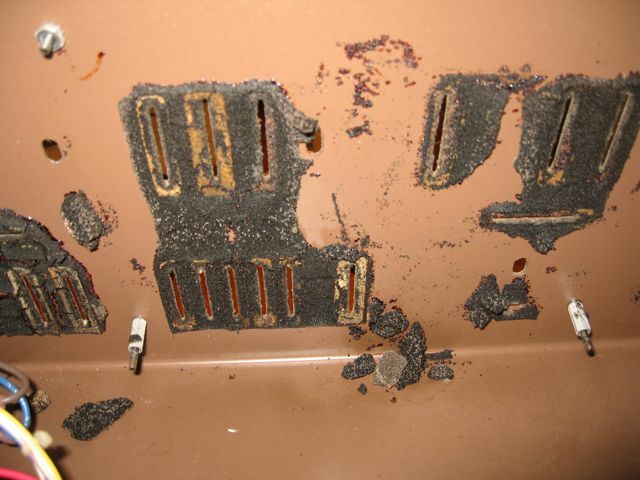 Here’s the tar, stuck to the underside of the control panel. Sticks like tar to tools. I use an Exacto knife to chisel it from the cover. For some reason the panel surface where it is stuck has rusted and it comes away with paint and surface rust. While I’m meticulously removing tar from the panel I have the keys soaking in a bucket with some dishwasher soap. All that unsightly yellow is dirt/smoke/dust etc. I should be taking more pictures. 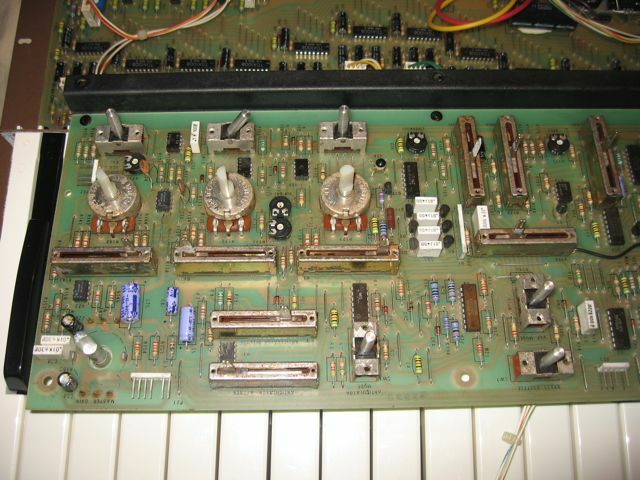 Here’s the panel board after I removed all the bits of tar with Q-tips, desoldered a few of the sliders, took them apart and cleaned them and basically spent way too much time tidying. It wasn’t my intention to remove all the sliders, take them apart and clean them, but that’s what happened. Here they are after being removed from the board. 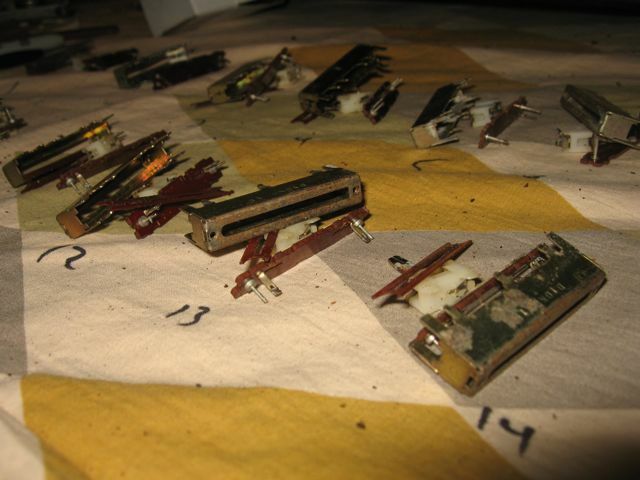 Desoldering is quick work, as is resoldering -too bad cleaning them is slow going. Numbers are corresponding to numbers on the board -easier than noting varying resistance values etc. 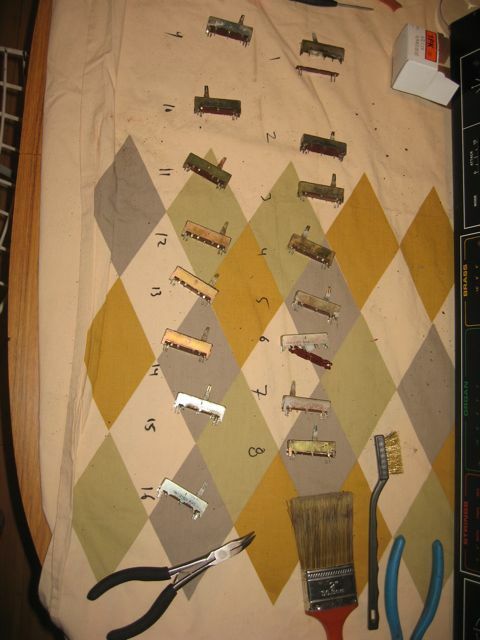 I use a little screw driver to bend the case tabs away from the board then pry the tabs with needle-nose pliers. After that they fall apart. Why not just spray some cleaner/lube in the slider and exercise it? See those little black specks all over the contacts? They are petro-chemical soluble and will turn into goo that coats the little contact fingers. 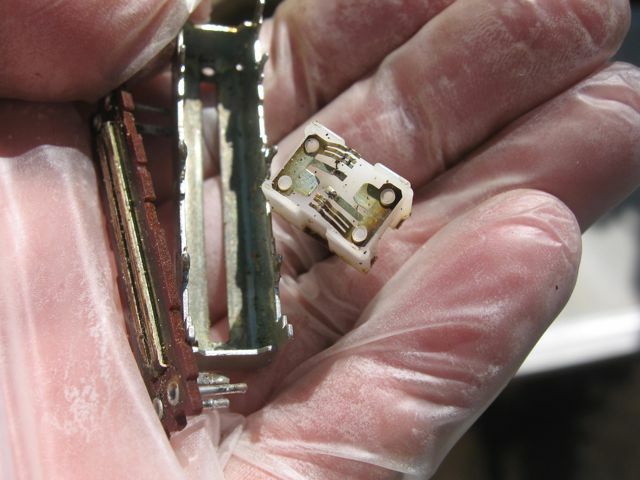 Proper procedure is to take the slider apart and clean remove them with a Q-tip and solvent. I use lacquer thinner -hence the gloves. Works great to clean out the inside of the case and the slider tracks. Reassembly is simple -just make sure you have everything in the right orientation. 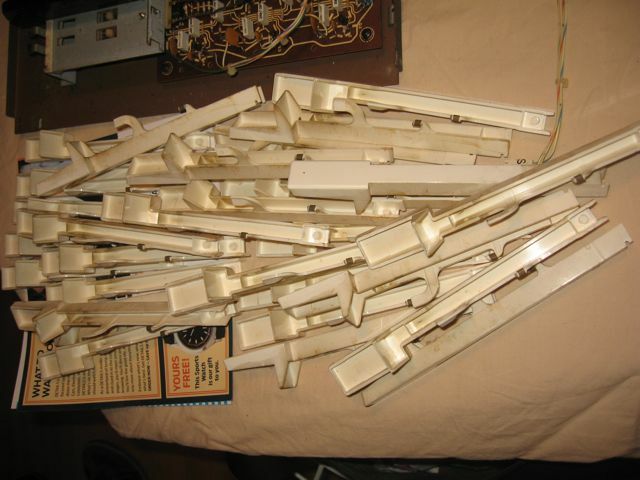 Alright, so another project falls in my lap while I wait for my Juno 60 toggles and slider caps. Once it’s all clean I’ll use my new DMM and try and figure out why it doesn’t work -lots of corrosion on contacts from 20 years in a damp basement so maybe I just need to clean some spade connectors. Next up I’ll refinish the wood, track down some slider caps and try and fix it. What do you think? Would you have bought this? Yes I would have bought it but I’m a sucker for punishment.